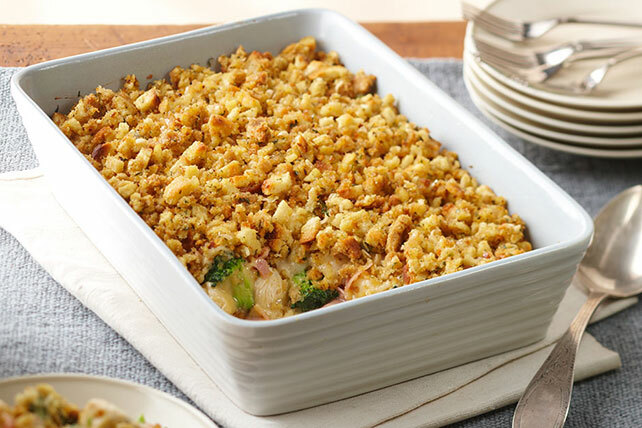 Enjoy this easy Chicken Cordon Bleu Casserole recipe. Bring it to your next potluck & be ready to accept compliments on your Chicken Cordon Bleu Casserole. Mix soup and mustard in medium bowl until blended; stir in chicken, broccoli and ham. Spoon into 2-qt. casserole sprayed with cooking spray; top with cheese and stuffing. While you can prepare this recipe with frozen broccoli florets, we prefer to use fresh since they bake to perfect doneness while retaining their bright green color. Prepare using OSCAR MAYER Deli Fresh Honey Ham.